In what degree the emergence of Collaborative Economy is catalysing a deep cultural reform towards the Common(s)? From this, a careful investigation opens the doors of this economic phenomenon through the cultural perspective. Therefore, whilst keeping the common(s) as the beacon of reference, this work is an attempt to explore Collaborative Economy’s shadows and lights and how it is affected and is affecting people’s values, beliefs and meanings. In this dissertation Felipe explores the degree to which the emergence of the Collaborative Economy is catalysing a deep cultural reform towards the commons. He describes his work is an attempt to explore Collaborative Economy’s “shadows and lights and how it is affected and is affecting people’s values, beliefs and meanings”. My intention is not just to deliver definitions of the word “culture” (although, in the following chapters, I will present what it does mean for me), rather it is to have it as the magnifying glass to understand contemporary economic phenomena, particularly the “Collaborative Economy”. Probably this slippery characteristic is part of this phenomenon: sometimes I fall into denial of its connective profile due to the singularities of some unique examples: and sometimes it is so huge and evident (it is everywhere, every when) that I cannot embrace it. Thus, observing “culture” in its wholeness is a constant movement of contraction and expansion. I believe this is because this background of every social and psychical relationship – culture – is, indeed, full of paradoxes: it distinguishes and unites us at the same time; it is, simultaneously, the net weaver between people’s minds, values and behaviours and the essence of identity. Instead of keeping thinking that the universe is a collection of objects, it is important to shift to the understand that in fact is much more like an abundance of subjects in relationship and interaction, where objects are alive and in constant cooperation (or as Gregory Bateson affirms, every organism on the planet can be recognized as “mind”, with self-organisation, intention for life and awareness, permanently involved in communication). Therefore, we need a science with deeper intentions, including wisdom and awareness of a larger whole, i.e. a meaningful science open to different kinds of knowing and not ego-oriented ambitions (“science for the sake of science”). Camila Carvalho: developer of Tem Açucar – a sharing platform for lending, donation and swapping of goods between neighbours. 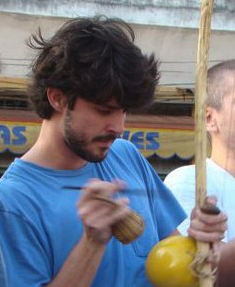 Guilherme Lito: Co-founder of Arca Urbana and a new economy Consultant. Sharlie Oliveira: member of Curto Café – a collaborative-based café. the Collaborative Economy is part of a deep cultural change in process, which is happening right now, and hence we don’t know yet if it’s leading to a reform (or a metamorphosis) in its deeper structures or not. Indeed, Collaborative Economy is provoking changes and new possible social patterns as we saw, i.e. at least clearly demonstrates that there are other ways we can address our needs – without depending so much on middlemen – and that economic transactions based in collaboration are possible with a potential unfolding in different shapes of work and community relationships. Thank you for sharing. Simon! Felipe is a brillant young man. I had the privillege to meet him in person at Schumacher a couple of times, during my visits to the College and I am very happy to see his Dissertation available for us.